To make appraisals meaningful and impacting, they must be frequent, informal, surprise free, prepared for by both parties, use two-way dialog, and be focused on performance and not personality. In this module, managers will learn to develop effective job descriptions, conduct a constructive performance appraisal, use performance-based statements rather than personality statements, prepare an action plan for subordinates, and use constructive feedback as a daily tool to shape and reinforce behavior. Managers may hate to do it, but they know disciplining employees is necessary, and counseling helps improve performance. In this module, managers will learn how to distinguish among coaching, counseling, and disciplining, pinpoint behavior change areas, develop a plan of action to change undesirable behavior, develop a strategy for restoring performance, prepare for counseling sessions, and monitor and maintain performance over time. Training, coaching, and delegating are the best tools that managers have available to them to build the team and achieve high productivity at both the personal and group level. 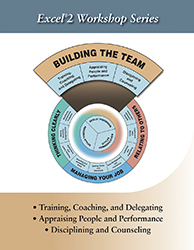 In this module, managers learn to plan a training session, break large chunks of information into interactive bits, organize short training sessions, plan a delegation session, and coach subordinates for better performance.